I was returning on a Sunday, and actually started searching for the ticket on Friday. Direct options were pricey - the KSRTC bus was priced higher than normal, but was still not exorbitant. The private options were over priced. I had an inkling to returning over the day, so that I could be home by night. My counterpart in Raichur suggested that I could take a train that leaves at 1130hrs - but that one was sold out, and I did not have any interest in booking a waitlisted ticket. As I pondered over the options I had, I got this idea of looking for buses from Mantralayam. Bingo! KSRTC listed a day time special bus from Mantralayam, leaving from there at 1400hrs! This was the perfect recipe I was looking for - with no further ado, I booked my ticket on this bus. The bus had seats only on the right side - the sun would be on this side. But I had no choice anyway. 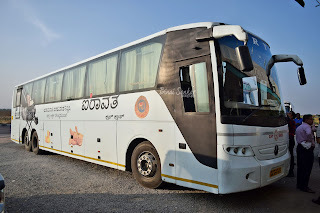 The website displayed the seating chart of a Volvo B9R, and the operating depot was shown as "Bangalore-2" - this meant it had to be a Scania or a Mercedes Benz, since this depot doesn't (to the best of my knowledge) have Volvo B9Rs that could operate this route. It was a very leisurely day at the examination centre. We had all of one student, and we went about doing the examination work at our own pace. We completed the examination by around 1200hrs, and headed to a restaurant for lunch. We were done with the lunch headed to the bus station by about 1240hrs. Mantralayam is about an hour by road from Raichur, and I had sufficient time to connect to my bus. However, no buses turned up for quite a while, and that had be tensed. My counterpart arranged for a vehicle in the meantime, to serve as a backup just in case I don't get a bus until 1300hrs. I got a bus exactly at 1300hrs - a quite run down NEKRTC Express Ashok Leyland (BS3) bus. It was quite crowded, and I had to stand for quite some time. I asked the conductor about the run time - to which he responded its usually 1hrs give it or take it 10 minutes. I informed him that I have a connecting bus to Bengaluru at 1415hrs - he quickly responded that we'll reach there much before that, and consoled me saying don't get tensed! The run was quite uneventful - the bus had stops every 10~15 minutes. We stopped at a bus station on the way - the bus station was located in the middle of a huge barren ground, with no villages/houses in the vicinity. At this point, I got a seat up front near the driver. The driver quickly asked me if it was me who had a connecting bus - I said yes. He smiled and asked me not to get tensed, and assured that we'd reach with atleast 10 minutes to spare. I really loved the way the crew considered by request, and their reassurance went a long way in keeping me comfortable. The driver maintained good pace wherever he could - he infact, even hurried the conductor when the bus stopped to pick their lunch. 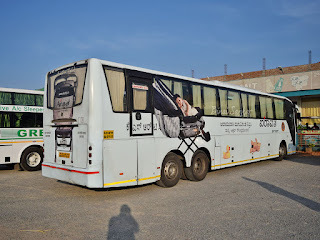 I was finally dropped at Mantralayam bus station at 1405hrs, and the driver parked the bus right next to my connecting bus. I really loved the way the crew on KA-36-F-1138 of Raichur-1 depot behaved that day - thank you guys for making my day! I was standing outside this white German lady now - KA-57-F-217 of Bengaluru-2 depot - a first generation Mercedes Benz Multi-Axle coach built by Sutlej. I hadn't, even in my wildest dreams, thought that I'd be travelling in a Mercedes Benz of KSRTC again. There are a very few of these buses surviving now, and those surviving too are destined to the gallows soon. I got into the bus and left my luggage, before getting off to use the restroom. The AC was already running, and hence I got back into the bus later. The bus was full - so were the overhead luggage racks. Mercedes Benz buses (the earlier generation, like the one I was on board) had very shallow and narrow overhead bins - I had to juggle some bags around to find place for my small backpack to rest. The bus backed out of the platform at 1417 - took a little time to get out of the bus station, since a few seat seekers came as we got moving - and we did have a couple of empty seats. The bus got on to the highway, and set course towards Adoni. The sun was on my side, and I had no option but to leave the curtains closed. I was quite tired from the travel the previous night, and I dozed off. My google timeline claims the bus took the Yemmigannur-Adoni-Pattikonda-Gooty route. This route was more of a country road. I woke up just as the bus stopped at a railway cross near Gooty - the halt was quite long. We traveled through Gooty town, and then joined the highway. The bus stopped at a restaurant soon after we joined the highway - Hotel Amogh, at 1645hrs. The restaurant was quite sleepy, and had a very vague choice of items - I had to pick between Onion Pakodas and Manchurians - I chose the former. The bill was a rip-off, but there weren't any options. I spent some time walking around till the crew returned. An AC-Sleeper coach of Greenline travels, and a Scania from SRS was also at the hotel. We finally started off at 1715hrs. We were on a four-lane road now. The driver was quite fast - not a ripper, but certainly not a crawler. He did the right gear changes, and did not lug the engine at any point of time. It was slowly getting dark, and there was really nothing to do. I tuned to a movie on my phone and spent the rest of the time. The bus pulled in for a quick break after Bagepalli toll gate (1932hrs) - it was short, and we got moving by 1935hrs. Traffic slowly thickened as we neared Bengaluru. As we passed the airport, I quickly got thinking about ways to get home. I had originally planned to travel to Kempegowda Bus Station (Majestic) and then take a metro from there. As we neared Hebbal, I quickly changed my plans, and booked a cab to take me home from Hebbal instead. I got off at Hebbal Esteem Mall by 2055hrs - the bus was perfectly on track for a 2145hrs arrival at Majestic! Cons: Nothing specific - may be maintenance needs to be worked on. Will I take this service again? Certainly a good option if you are looking to return from Mantralayam over the day!